The only wine I drink whilst turning tricks! I go anywhore and everywhore I want. Well, now THERE’S a little extra those soapland adverts in Japanese sports pages never mentioned before! BTW…there are a couple of grammatical particles in Japanese for the word “noni”. The other is like “Even if” or “despite” (condition A), then (Condition B) will be the case regardless (of Condition A). 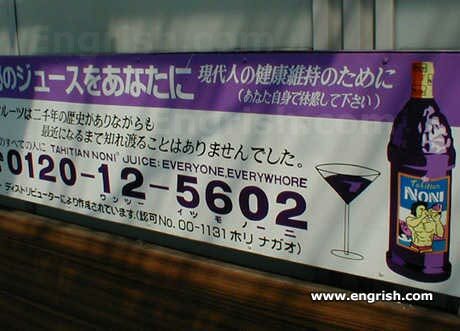 Hoping this provides fodder for more imaginative Engrish comments here! Everywhore…. comes in a bottle. Hmmmm. Must cure the jack. Noni Juice! Another food fad that seems to have almost run its course, here in Oz. In a long life, so far I have never seen any form of fanaticism, either dietary, religious, or political, confer any benefits on anyone…..Or anywhore. Drink Noni Juice, and you too can become a huge, fat, Polynesian. So his wife was an instant converted fan. Sounds like an; “excusive or gate”. @Pete 0500. Sounds like an; “exclusive or gate”. @Marum | 10:16 pm: You sure, mate? To me, an EXCLUSIVE OR gate allows either, but not both. Maybe I misunderstand Pete’s post. Some time ago I misplaced my purse, didn’t know where I left it. A friend suggested that if I recite the 10 commandments to myself I might remember. When I got to “Thou shalt not commit adultery” I suddenly remembered! Noni for everywhore………. He’s a real no-whore man…. or gate = allow one state “or” the other to activate the gate. and gate = requires all states to activate the gate. exclusive or gate = one stae is exclusive. Therefore that gate will predominate over all the other states when it is active. I think that is clearer. How would having one’s hands on one’s hips help? At happy hour prices, I usually have a drink in both hands. Ambidextrous drinking, is one of my most useful skills. @DNT 2337. I have just thought of an alternate use for “Truth” tables. Edit: Coupla’ typos. I am such a lousy typist, that I cannot both think, and type, at the same time. Even when I am ty-sober, and not ty-pist. Well, whores like juice too.